In our article about our first impressions from the Gridseed 5-chip Scrypt Asic earlier this month we were not very happy with our initial experience from the device. It seems we’ve got one of the earlier builds that were not very well built and the software for using them was also at a very early stage. Today however things look much better, we just got a new unit that we have ordered and it is much better built and uses the STM32 Virtual COM port driver instead of the CP2102 USB to UART Bridge Controller that our previous unit had. We have tested the new ASIC device and it works just fine with the STM32 drivers installed with the modified for low power usage cpuminer for Scrypt mining by giving the virtual COM port number of the device. The ASIC also worked just fine when we have replaced the STM32 vitual cOM Port driver with WinUSB using Zadig to use cgminer 3.7.2 for Scrypt mining on the ASIC. 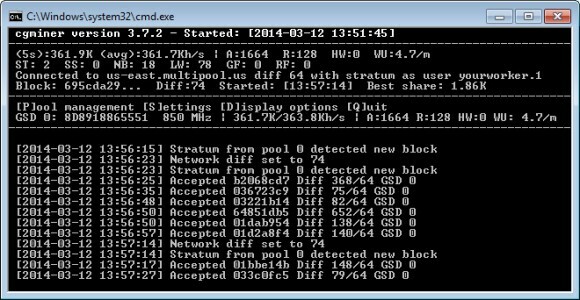 We still haven’t tried using the new 5-chip Gridseed ASIC device to work in dual mining mode with TLC and BTC mining running at the same time as apparently the dual mining method that have already described for our older ASIC using the CP2102 USB to UART Bridge Controller is not working for devices with STM32 Virtual COM port drivers, so we’ll be getting back with more details on that later on when we figure it out. For the moment however we are much more satisfied with the newer revisions of the 5-chip Gridseed LTC/BTC ASIC devices, especially when we take into account the improvement of the software support side for them in the last few days. Peter OD, we have purchased our old and this newer unit off eBay in order to get them faster and without customs delays. They can be bought cheaper directly from China, but there is no point for single units and we wanted to be able to test them first before deciding if they are worth ordering in larger quantity. Anders, I suppose that the WU value is calculated different on the ASICs as compared to the value when using video cards for mining, the pool does report proper hashrate from the ASIC devices, so there is no problem. Anders, the Gridseed ASICs are looking more and more interesting as an alternative to a GPU, they do still need some improvement, mostly on the software side though, but in general things are looking better and better. However do note that they are good only for Scrypt coins and with so many units being made and shipped soon Scrypt might turn out to be not so attractive anymore to mine with GPU, so GPU miners may start moving to other algorithms where these ASICs will not be useable. So do have that in mind as well when considering buying Gridseed ASIC devices. JOAT, it is hard to say… we are going to get a few more Gridseeds for sure, but we are still going to use GPUs as the ASICS are only limited to Scrypt cryptos and there are already a few other algorightms that are promising. For Alpha technologies… we cannot comment as there are still very few details and a lot of concerns if they are going to be shipping anything at all. I only can put in LTC mode or BTC mode (dependind the drivers intalled.) not in dual mode. I have the model with stm32, and if i intall STMicroelectrics drivers of windows update i can put BTC mode. If i install zadig Winusb drivers i can put LTC mode. Anyone know a way to put in dual-mode? My fan of gridseed, run with a lot of rpm, how i can to make it run at lower rpm? Do you have a place that we can order direct from china if anyone is interested in buying in bulk? I am very glad that I found this community. 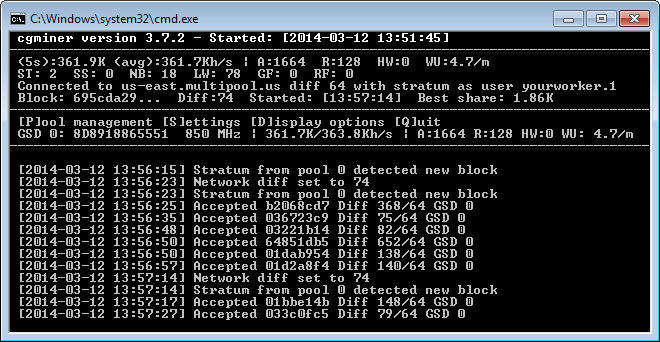 Right now I am mining Dogecoin and Netcoin. Purchase is apparently possible directly from Gridseed for the best price, but the minimum order quantity is 500 units. Dan, unfortunately there is no better alternative for dual mining mode. It seems more like something that Gridseed cooked quickly just to say it is working and then they even dropped support for the G-Blades. The community has also picked up developing only miners for Scrypt mining mode as BTC mining with these devices is getting pointless with their power usage and the hashrate they produce when also mining Bitcoins.